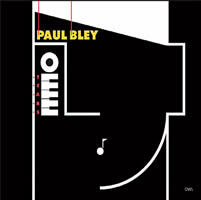 Paul BLEY: Tears (rec. Paris, 5-19-83). Bley (pno). Owl 034 984 755 9 (http://www.universalmusic.fr/). Purchased from Grooves Inc., Basel, CH (http://stores.ebay.com/groovesincuk). Bley summons past routines, haltingly. Also, Dolphy’s Music Matador (1963) and a tribute for trumpeter Roy Eldridge. Beautiful and rigorous. Johann Sebastian BACH: Die Kunst der Fuge, BWV 1080 (1740-45, 1748-50) (rec. 2008). Christian Rieger (hpsi after Christian Zell, 1728). CAvi-music 8553185 (http://www.avi-music.de/). Distributed in the US by Allegro Music (http://www.allegro-music.com/). II shows appealing swagger, but the forceful air and robust textures often wore me down. A 9:34 unfinished fugue works its way to vehemence. 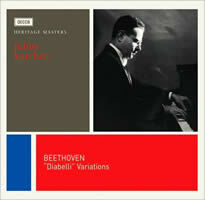 Ludwig van BEETHOVEN: Thirty-three variations on a waltz theme by Anton Diabelli, Op. 120 (1819-23) (rec. 1953); Polonaise, Op. 89 (1814) (3/1968 live, London); Sonata No. 32, Op. 111 (1821-22) (rec. 1955). Julius Katchen (pno). 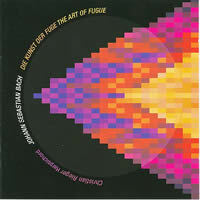 Decca 478 1727 (http://www.deccaclassics.com/). At 26 Katchen sailed a confident, fleet Diabelli. Two more years brought an Op. 111 still tighter and rather objective. Good mono, no notes. Mikhail GLINKA: Sonata for Viola and Piano (1825-28, compl. Vadim Borisovsky, 1932) (rec. 1979). Anton RUBINSTEIN: Sonata for Viola and Piano, Op. 49 (1855)* (rec. 1979). 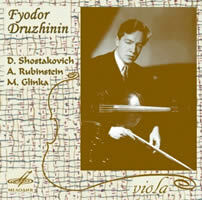 Dmitri SHOSTAKOVICH: Sonata for Viola and Piano, Op. 147 (1975) (rec. 1975). Fyodor Druzhinin (vla), Mikhail Muntyan, Larisa Panteleeva* (pno). Melodiya MEL CD 10 00867 (http://www.melody.su/eng/). Purchased from rarervnarodru123, Moscow (http://myworld.ebay.com/rarervnarodru123/). Dedicatee of Op. 147, Druzhinin taped it as if DSCH and mentor Borisovsky could hear. Cohesive, intense, no lingering. Close, vibrant sound. 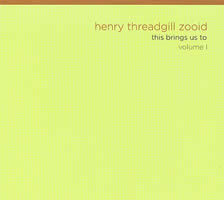 HENRY THREADGILL ZOOID: this brings us to volume I (rec. Brooklyn, 11/2008). Threadgill (fl, alt sax), Liberty Ellman (guit), Jose Davila (trom, tuba), Stomu Takeishi (bs guit), Elliot Humberto Kavee (drums). Pi Recordings PI31 (http://www.pirecordings.com/). The droll title may mean Threadgill is sticking with this group. It boasts superb chops and agile brains, both needed in his complex system.